I am Nick Heighington and I am from London, Ontario. I’m here to share my story of how Sledge Hockey enables me. 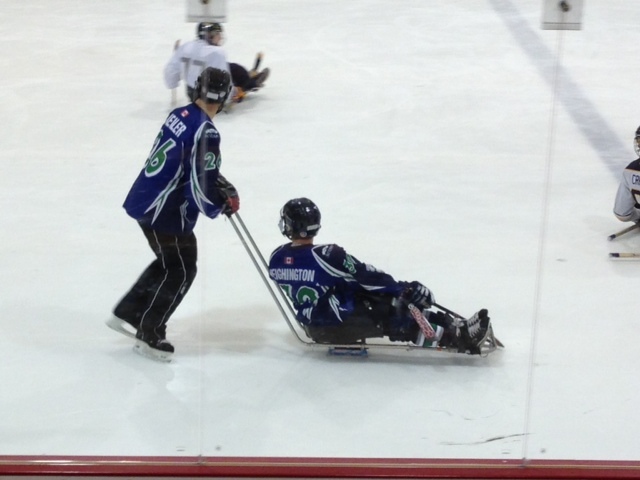 For those that don’t know what Sledge Hockey is, it’s almost similar to the able-bodied hockey. The only things that are different are you sit down on what’s called a sledge. A sledge is custom-made and made the way you wanted it to be. It’s got two blades on the bottom of the sledge and you sit in what’s called a “bucket”. If you see the picture that’s posted on here, you’ll know what I mean. As for the sticks, it is made of either carbon fibre or wood. The bottom of each stick has what is called picks, which is two metal pieces on each side of the stick with sharp points so you can push yourself around the ice. As for the type of association that sledge hockey is in, we are what is called the Ontario Sledge Hockey Association. You can visit their site at www.ontariosledge.com, they have the information you need to know about how to join. There are two different leagues in this association: Junior Development and Intermediates. The different between the two is in the junior development, you can be a disabled child that cannot push themselves and have a pusher to help you push around the ice. Some players can push themselves as well. In this league, there is some contact (hitting the other players) but this is a development league, which means you develop some skills that you hope to take to the next level and it is more of a recreational league and by that I mean it is nothing compared to the intermediates level. The intermediate level is more competitive and some body-contact can be involved in the league. We play two tournaments a year, usually 8-10 games a season plus playoffs. In the Development level, there are usually 10-12 teams and they are split into two conferences based on where the team is located geographically. In the Intermediate, same thing but more teams at that level. So, to answer the question of why Sledge Hockey enables me is simply because you get to do what you enjoy. You do what you dreamed of becoming one day, which is to be a superstar of sledge hockey and hopefully be able to play for the Canadian National team that competes at the Paralympics. But that is not why I am involved in this sport. I am involved because I always thought I would be able to walk and play able-bodied hockey ever since I was a kid. But when I tried sledge hockey at age 5, I thought to myself, “Would it be awesome to play this sport for as long as I can handle and play well enough to be on the Canadian Sledge Hockey team? ?” Now here I am, I’m 24 and played this sport for 17 years and have a lot of experience playing this sport. Also, Sledge hockey can also give some skills that you probably haven’t use much all your life, like teamwork, being a team player and having a positive attitude. You develop skills every year and that’s what counts. My favourite saying of all-time is when my dad said, “Never give up, keep trying! !” I always remember that saying because it makes my dad happy and it makes me become stronger in life. Just wanted to say thanks for reading my article and hope you have a better understanding of what sledge hockey is all about. For those who are interested in trying this sport, go to your nearest city and try it out for your first time and if your team is hosting a try-out session, I would recommend that you do that because then you have an idea of how to do it and how it works. If you are interested in joining a team, then start contacting the team and they will give you some more information on how to sign up.